The 2018 MAIAA Cohort includes (front row): Nicholas Hunt, Adelaide Reimbold, Vincent Martino, Kevin Flanegin, (back row) Rose Hull, New Faculty Director Dr. Scott M. Fuess Jr., Joseph Lang, Brady Baker, Payton Buckmaster and Taylor Berry. Students complete 10 graduate courses and 36 credit hours. Through the program, they earn their MAIAA degree and the opportunity to take a significant step forward in their pursuit of landing a job in the competitive field of collegiate athletics. 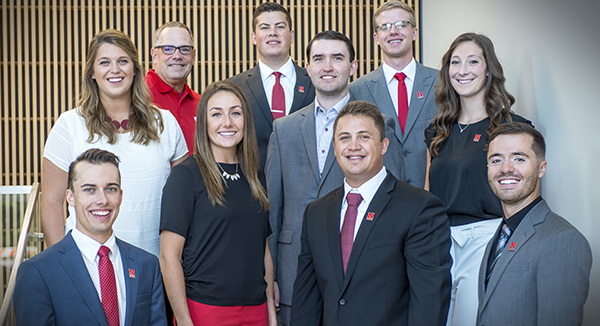 The MAIAA program became the first of its kind to offer students a fully-funded two-year graduate education with guaranteed internship opportunities in the Nebraska College of Business during their first year and Nebraska Athletics for their second year. Positions at Nebraska Athletics include opportunities in academics, marketing and fan experience, communications, development, life skills, digital media, compliance and much more. Applications for the fall 2019 cohort are now being accepted. The deadline for applications is February 1, 2019.